By John L. Parker, Jr. Universally acknowledged to be the best fiction book about running ever, this classic is being republished after being out of print for years. The undisputed classic of running novels and one of the most beloved sports books ever published, Once a Runner tells the story of an athlete’s dreams amid the turmoil of the 60s and the Vietnam war. Inspired by the author’s experience as a collegiate champion, the novel follows Quenton Cassidy, a competitive runner at fictional Southeastern University whose lifelong dream is to run a four-minute mile. He is less than a second away when the turmoil of the Vietnam War era intrudes into the staid recesses of his school’s athletic department. After he becomes involved in an athletes’ protest, Cassidy is suspended from his track team. Under the tutelage of his friend and mentor, Bruce Denton, a graduate student and former Olympic gold medalist, Cassidy gives up his scholarship, his girlfriend, and possibly his future to withdraw to a monastic retreat in the countryside and begin training for the race of his life against the greatest miler in history. A rare insider’s account of the incredibly intense lives of elite distance runners, Once a Runner is an inspiring, funny, and spot-on tale of one individual’s quest to become a champion. John L. Parker, Jr. has written for Outside, Runner’s World, and numerous other publications. A graduate of the University of Florida’s College of Journalism as well as its College of Law, Parker has been a practicing attorney, a newspaper reporter and columnist, a speechwriter for then Governor Bob Graham, and editorial director of Running Times magazine. 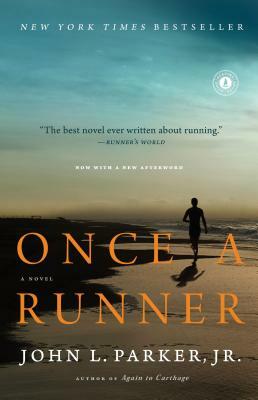 The author of Once a Runner, Again to Carthage, and Racing the Rain, he lives in Gainesville, Florida, and Bar Harbor, Maine.